The items below are being offered an attractive sale price because they are end of line, demonstration items or from inservice courses. They are offered with a one year warranty and may be returned within 30 days of purchase for a refund. Please contact djb microtech for the availability of any item before ordering. Items will be added to this list so if you are interested in a bargain add this page to your favourites. Condition: New. As stock is old a new battery has been put in. These ones work on the priciple of increasing the volume and hence reducing the pressure. A good addition to the traditional ones where the pressure is reduced using a vac pump. Very, very difficult, if not impossible in the classroom, to pull apart. These items have been tested and were working although obviously have been used. 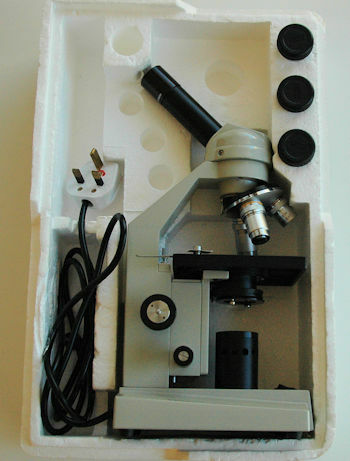 dip type, epoxy body, parallel carbon electrodes. Temperature range: 0 to 80°C. Temperature compensation: automatic from 5 to 35°C. Response time: 98% of full scale reading in 5 seconds, 100% of full scale in 15 seconds. 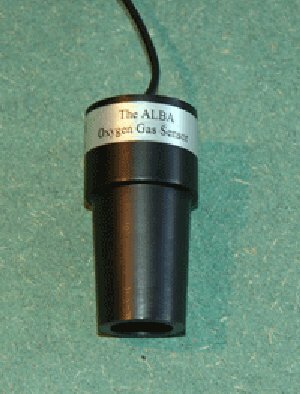 Suitable only for the ALBA data logger. This item has been around the store for some time. Tested it by breathing on it - one long breath out. Graph shown opposite. Condition: looks as new but of unknown age. The Mystrica colorimeter has wireless connectivity that allows it to be used with iPads (Air, Mini, 3rd & 4th generation) and iPhones (4S and later but not 4). Versatile use as stand-alone or with a computer. Performance that rivals instruments many times the price. Readings displayed as absorbance or transmittance. 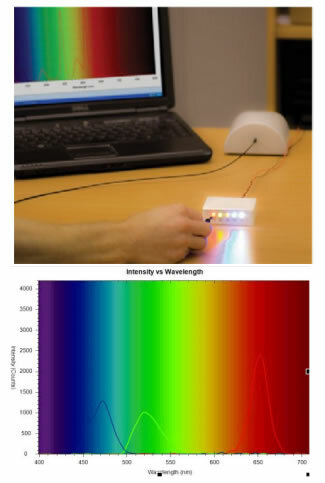 USB link displays and stores results as tables and graphs. 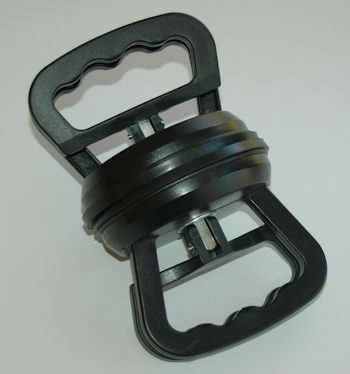 Enables grip strength, pinch strength and muscle fatigue to be studied. Is there a correlation between hand size and grip strength? Is muscle fatigue time similar for all people? Does wrist circumference exhibit any correlation with grip strength? Is grip strength a function of age? 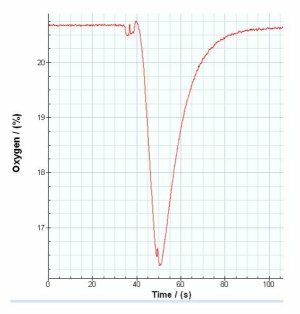 The Respiration Monitor Belt (RMB) is used for investigating human respiration rates. It must be used along with djb microtech's Low Pressure sensor B1-1100.10 which connects to the analogue inputs of the ALBA Interface. The RMB is supplied with tubing and connectors to enable easy connection to the pressure sensor. the respiration rates of males and females. This unit was originally supplied by Data Harvest. Condition: Light marking on top pan and surrounding silver. Software for the old serial connection can be downloaded from the internet. the effect of external temperatures on skin temperature. in connection with column chromatography. 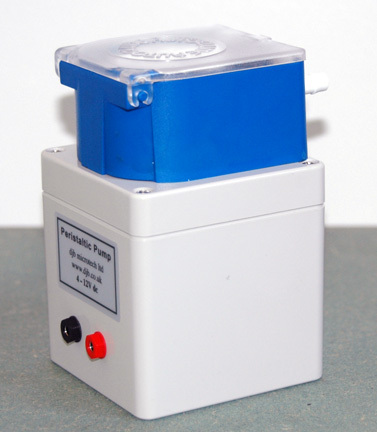 The pump has two rolling plastic pillars that press against the liquid in the silicone tubing. The motor supply voltage is 4-12V dc. At any set voltage the speed of the motor is constant. 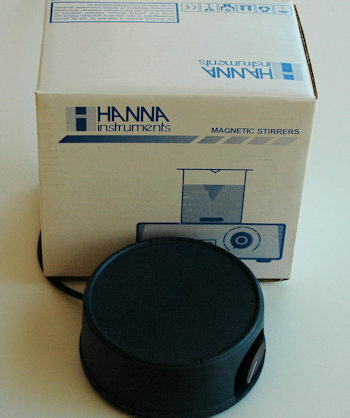 The pH tester is a user friendly and easy to use pH meter. Calibration is just a touch of the CAL button and the measurement can be activated to manually hold or to obtain an end-point reading automatically. 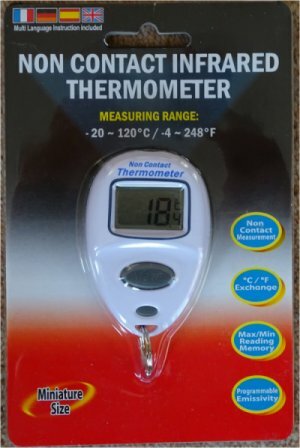 The unit is housed in a water resistant case and features an easy-to-read, 8mm LCD display indicating pH over the range 0 - 14pH with a resolution of 0.1pH and an accuracy of ±0.2pH. 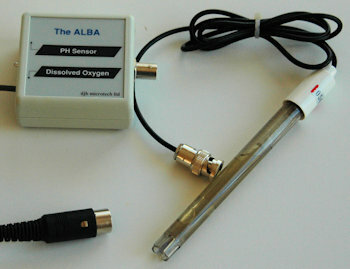 The ambient operating range of the pH Meter is 0 to 50°C. These are the old style sound switches which connect to TSA and the ALBA data logger. Ex demo model and obviously used but working well. This Light Bridge will operate with all versions of TSA. Requires ALBA Disk 4 or can be used as a standalone board. For use with AC applications on Disk 3. To be used with TSA or ALBA. Original design using lens end bulb as an I.R. source. Condition:obiously used but in good working order.